Communicating effectively with your audience, no matter who they might be, is a huge step in the right direction. 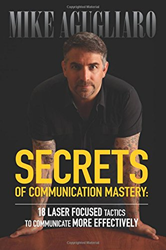 Founder of CEO Warrior and co-owner of $23 million dollar residential service business, Gold Medal Service, Mike Agugliaro, has announced the release of the third book in his “Mastery” series, entitled “Secrets of Communication Mastery: 18 Laser Focused Tactics to Communicate More Effectively.” The book, which focuses on proven methods of interaction that close the gaps commonly found in communicating, is currently available for order at the Secrets of Business Mastery website and at amazon.com. Like many service business owners, Agugliaro spent years working up to 18 hours a day in his truck, and wasn’t getting the results he wanted or needed. With a revised leadership strategy, Agugliaro and his business partner grew their less than $1 million business into a $23 million dollar home service empire with 150 employees serving more than 100,000 customers. He turned those strategies into his business coaching business, CEO Warrior, and has since authored two books, published Home ServiceMAX magazine, and hosts a weekly podcast series, teleseminars and monthly coaching events. Agugliaro’s first two books, “The Secrets of Business Mastery” and “Secrets of Leadership Mastery” are also available on the website, and are very powerful tools to be used in strengthening the position of professionals in the business world. CEO Warrior is a business consulting and mentoring firm, providing tested and proven methods to defeat the roadblocks that prevent small to mid-sized businesses from achieving their ultimate success. By performing a meticulous business audit, CEO Warrior targets the specific areas each business needs to address, eliminate, enhance or add in order to reach their business goals and attain what every business owner wants in the end: financial independence. For more information about CEO Warrior, visit http://www.CEOWARRIOR.com.